In whatever case, the plan is to run Scenarios 1-07, 09, 10, 12, 16, 18, 20 and 22. Anyone feel free to drop in. 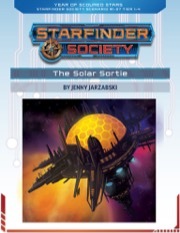 When Historia-7, the leader of the Dataphiles faction, uncovers the first hints of a conspiracy operating against the Starfinder Society, the PCs must assist her in uncovering the truth. Sent to a corporate space station orbiting the Pact Worlds' sun, the PCs must earn favor with the hedonist son of a corporate CEO to gain access to the confidential files Historia-7 needs. However, the PCs are stuck in the middle when this corrupt dilettante's proclivities and shady associations emerge to thwart the Starfinders' covert infiltration. Content in The Solar Sortie also contributes to the ongoing goals of the Dataphiles faction. Last edited by KapaaIan on Tue Nov 20, 2018 3:09 pm, edited 5 times in total. Moved to 13th because of election day. And moved (hopefully) one last time because of Parent-Teacher conferences. Will plan to run on both the 20th and 27th. I will not be able to make it the 20th but I am good with the 27th. Cancelled due to lack of interest. Will revisit next week or post holiday season.